Although most people tell anecdotes to family and friends every day, many nonprofit marketers and fundraisers struggle to tell their organization’s story in a way that captivates supporters. The good news is that you don’t have to reinvent the wheel. Great storytellers use simple archetypes and strategies to grab an audience’s attention, and these can help you create impact updates and appeals that engage donors and make them eager to get involved. Here are four different ways to present a story that helps donors connect with your cause and move them to take action. One of the best ways to get an audience to take interest in your story is to give them a main character to identify with and care about. That’s why so many books and movies begin with a scene introducing the main character. In Raiders of The Lost Ark, for example, the first couple of minutes introduce Indiana Jones as a brave and capable hero. From the beginning, the audience has someone to root for. It’s especially important to give your audience an individual to connect with because donors are more likely to be moved to act by a single person than by a large group. This psychological concept is called the Identifiable Victim Effect, and it tells us that viewers of charity communications are more likely to donate when presented with a single, named person in need than with a group of unnamed people. An individual victim creates an emotional bond with the audience that motivates them to help. Although Pencils of Promise educates thousands of children in Guatemala, Ghana, and Laos, their Seasons of Promise campaign introduced just one eleven-year-old girl. Juana tells viewers about her family, her village, and the dilapidated school Pencils of Promise is helping them rebuild. By focusing on her personal story, the video allows potential donors to forge an emotional connection with this individual. Viewers don’t see an endless sea of uneducated people in need, they see Juana and how their donation can help her achieve her dream of becoming a teacher. Generosity.org also uses the power of one person’s story to illustrate how a lack of clean water holds back mothers like Hanna. She tells the audience how access to water would change her family’s future. Sometimes, the best way to mobilize help for many people is to show donors the reality of just one person affected by your cause. Individual stories like these make complex social issues personal to your audience. Offer details like the individual’s name, location, and personal goals (always with permission). Let the individual do the talking. Their story will be more impactful when it’s told in their own words. Use pictures or video of the person so your supporters can put a face to a name. The shock factor is a sure way to get an audience’s attention. Have you ever watched a movie that begins with the ending, where you see the characters in a strange situation but don’t know how they got there? As a viewer, you immediately begin asking questions and trying to understand. In other words, you become invested and engaged in the story. Consider starting an email, blog post, or fundraising appeal with an arresting fact that grabs your supporters’ attention and draws them in. 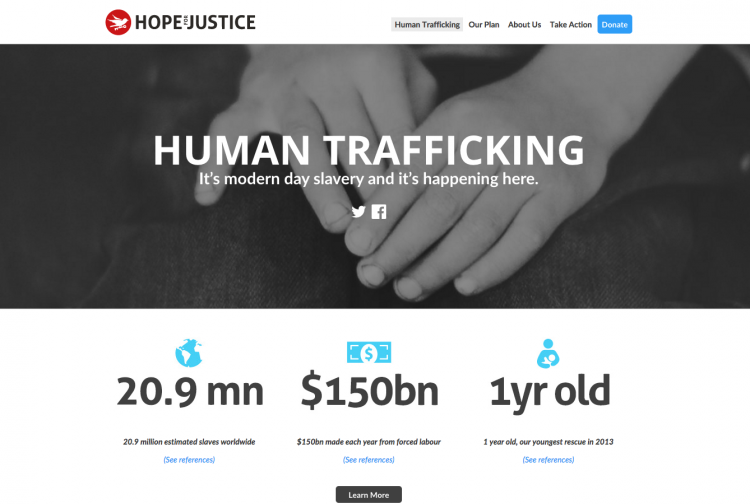 Visitors to Hope for Justice’s website may be shocked to learn that over 20 million people are victims of human trafficking, or that it is a $150 billion industry. The fact that Hope for Justice has rescued victims as young as one year old is just as disturbing. By introducing these key bits of information, the organization compels you to learn more about the problem. 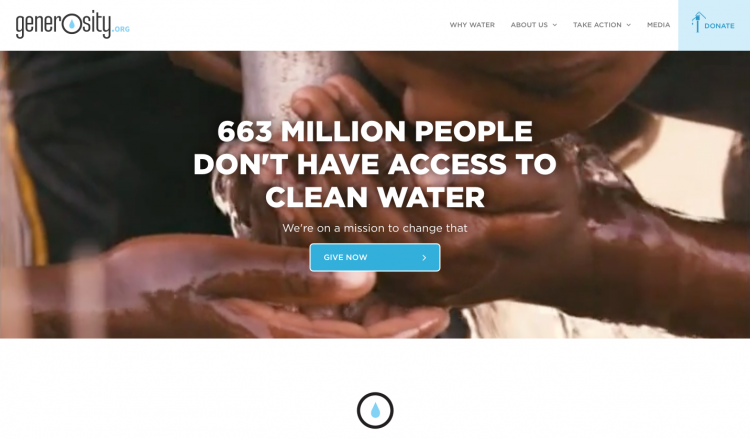 Generosity.org also uses a powerful statistic on their homepage to grab donors’ attention, but both organizations know that numbers or surprising facts aren’t enough to incite action. Like a book with a great first line, they have to follow up with details and solutions to keep people interested. Organizations can hook an audience with a surprising introduction, but their story must go on to provide context and solutions. Think outside of the box for metrics or facts that are so unexpected they demand an explanation. Reveal the people and places behind the headlines. Once you have donors’ attention, give them more details about the situation on the ground. Get to the action. The longer your audience has to wait to see the point of your message, the more likely you are to lose them. In fact, one of the cardinal rules of screenwriting is “get in late and leave early.” This means that your story begins when the action is already unfolding. Thrusting your audience into a moment of conflict or crisis creates a sense of urgency, which is vital for motivating people to act. This is a particularly effective technique for disaster relief organizations, who must respond and fundraise spontaneously. To tell their founding story, Team Rubicon takes their supporters back to the 2010 earthquake that devastated Haiti. In just a couple of sentences, they convey how natural disasters can uproot and even end countless lives. The two marines that founded Team Rubicon “knew they could help” and flew to the area. This “on-the-ground” approach to storytelling also keeps the focus on the problems at hand and the solutions that the organization offers. By detailing the dire situation and Team Rubicon’s swift actions, the story helps donors feel a more tangible connection to the crisis and the aid that their gifts make possible. Be descriptive, not dramatic. Give your audience details like sounds, smells, and visuals and let those evoke emotion. It’s not enough to convey devastation. Show donors what actions you are taking and how they can help. “The Quest” is one of the oldest and most popular story arcs. In these stories, the main character is trying to reach a powerful place or object, not just for their own gain, but for the good of their community. The Odyssey, The Lord of The Rings, and The Wizard of Oz are all quest stories. For some social impact organizations, particularly those searching for cures to diseases, presenting the cause as a quest is a great way to engage your community as you pursue your goal. 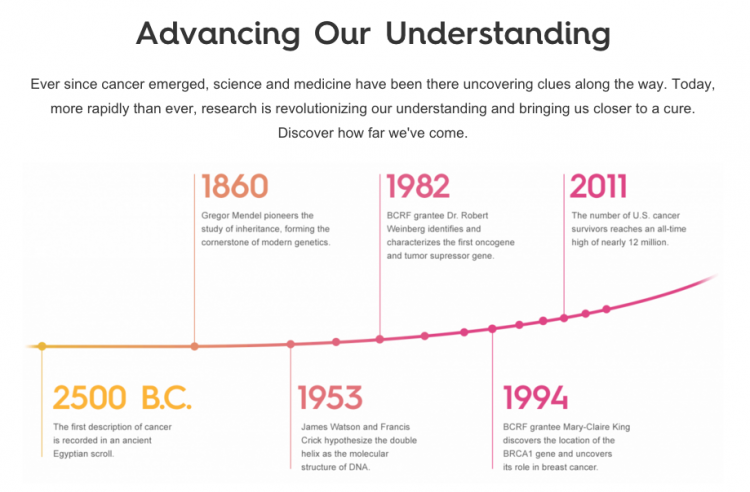 The Breast Cancer Research Foundation uses a detailed timeline to trace the discovery and treatment of breast cancer. Their video, featuring pioneering researchers, explains how their work is bringing the world closer to a cure. The video goes beyond stating the problem. It presents research as the path toward success and emphasizes how far we’ve already traveled down that road. When you show your audience the progress you’ve already made toward your program or fundraising goals, you can tap into the power of the Goal Proximity Effect. Studies have shown that people become more likely to contribute to a campaign as it gets closer to its goal. Essentially, people want to be a part of a winning team, so remind them of the headway you’ve already made. With a clear goal growing closer and closer, you can confidently ask donors to support your quest and help you cross the finish line strong. Use a concrete goal, whether a cure or a fundraising milestone, to motivate your audience. Explain what problems you have solved along the way that make your long-term goals possible. Storytelling—and many of its arcs and techniques—is built into our lives. We tell stories to entertain, to learn, and to mobilize. The best nonprofit stories can accomplish all three of those goals. No matter your cause sector, your organization can use strategies like these to help donors understand your mission and take action.